I simply LOVE eclairs; the soft pastry, luscious pastry or chantilly cream and decadent chocolate icing. I never pass up an opportunity to treat myself to one of these sinful delights. Not everyone makes a perfect eclair: the pastry is too hard, the cream too heavy and the icing too hard/ runny. So why not make my own? I enjoy browsing through the cookery section in book stores. I could spend hours flipping through glossy pages of beautiful food, devouring all the recipes and imagining myself eating all that gorgeous looking food. One of these excursion, I came across a book on eclairs! YES! The Secrets of Eclairs by Marianne Magnier-Moreno. The book was filled with detailed instructions and tips and beautifully illustrated recipes. Perfect! So last Friday, I attempted to make my own. Now I highly recommend you read ALL the instructions and tips completely before you begin making absolutely ANYTHING, because that way I wouldn’t have missed the requirement to have a 20mm round tip to pipe out the eclairs. I love the idea of dark chocolate and orange and I decided that that would be the icing for my eclairs. Into a non- stick saucepan, pour the milk and water. Add in the butter, salt and sugar. Place over a high heat and stir with a plastic spatula until the butter melts. The mixture resembles a marbled yellow and white liquid. Bring to the boil and let the liquid bubble over for about 2 seconds. Remove from the heat and add in all the flour and immediately start mixing; slowly at first and vigorously until no more dry flour is visible. Then place back on the heat and continue stirring, until the mixture no longer sticks to the saucepan, spatula or your fingers. This is called “drying” the mixture. The last part of the recipe calls for adding the eggs. Beat up both eggs and add in half the mix to the pastry and continue stirring. If the pastry sticks to the spatula and doesn’t drop off easily, the pastry is perfect. If the pastry doesn’t stick at all, then add the rest of the egg mix gradually, testing in between additions. The final step is to pipe the eclairs on a baking tray lined with parchment paper/ silicon baking mat. Fit a piping bag with a 20mm round nozzle and fill the bag with the mixture. Pipe the eclairs in a single fluid motion, using a knife to cut off the edge of the eclair. You might want to use a ruler to have an idea of how long your eclair will be (around 12-14 inches is a good length). Leave about 3cm between each eclair to allow them to rise evenly. Bake at 150 C for 55- 60 minutes. I have an electric oven that tends to get heated quickly, so my pastry was baked in about 25 minutes. Some of the pastry were slightly burnt at the bottom. I couldn’t pipe all the filling the first time and my friend, Naveka, suggested I pipe the remainder as little spherical blobs. 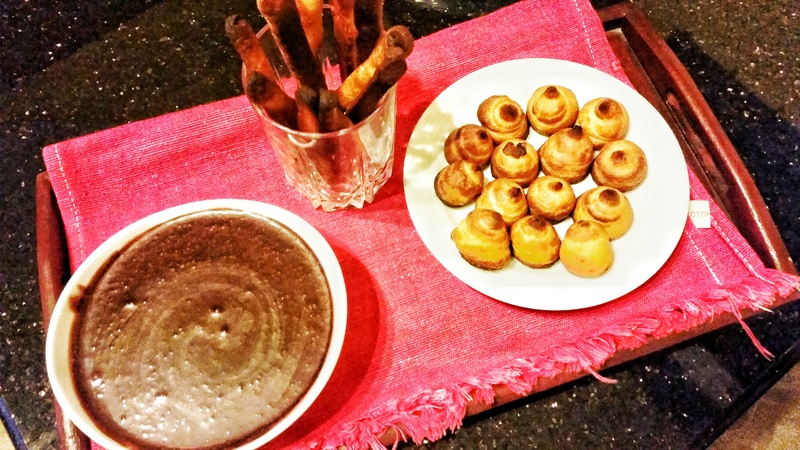 The end result: eclair sticks and balls. As Naveka said, what is one’s fail is another’s invention. Wise one that one is (check her out on: https://www.facebook.com/thescribblelist). I made a dark chocolate dipping sauce, infused with some orange zest and the juice of a whole orange. I used a ganache recipe for the dip. Once, you dipped the sticks and balls in the sauce, you barely noticed the little burnt bits. And it worked, as I really don’t like wasting food. My family actually enjoyed it. Turned out to be quite addictive. (Recipe adapted from “Secrets of Eclairs” by Marianne Magnier- Moreno). Thanks again Arielle! Glad you’re enjoying the blog! Thanks for the follow! I just followed you back and your blog is super interesting and fun to read! :).